Check out the rather glorious Fender Katana!! For our Guitar of the Week we have selected the rather eccentric and perhaps even sorely missed Fender Katana. Well that was the plan. The reality was sadly a little bit different. Rather than utilise the prodigious guitar building talent that Fender must have had at the time they instead got their marketing director Dan Smith to have a go. Some rather uncharitable folks have suggested that Dan Smith ducked the challenge preferring to get a child with crayons to give it a go. However, the Fender Katana was the result. Released in 1985 rather unsurprisingly the Fender Katana did not sell very well and was discontinued shortly afterwards in 1986. What was the Fender Katana like? The Fender Katana has a rather fetching triangular body with a 24.75” glued in maple neck. The 22 fret bound fretboard was topped off with rosewood and, in keeping with the body shape, the fret markers are triangular. 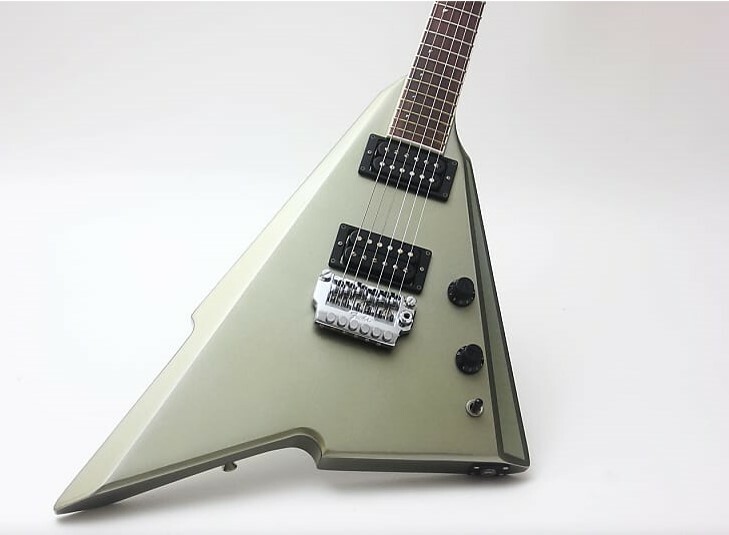 It featured a string clamp, an arrow-head-shape headstock and a neck that matched the body colour. The guitar was fitted with a pair of open-coil humbucking pickups and there were master volume and tone controls. The pickups were accessed through a 3-way pickup selector. It also had a 2-point System I locking vibrato unit. The Fender Katana, because it was rather short-lived, could be seen to be a bit of a collectors item. Certainly if you wanted to own one you would probably be looking at parting with a serious amount of cash. For example Reverb have currently got one listed for £1299.99 plus shipping. If you are interested you can find out more details at Reverb. Daisy Rock Guitars – Just for Girls?